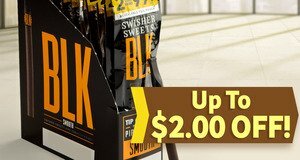 Up To $2.00 Off Swisher Sweets BLK Units! Get up to $2.00 Off select units of Swisher Sweets BLK cigars! The JR price has been reduced by up to $2.00 Off!